A tibial stress fracture is a fortunately uncommon cause of leg pain in athletes, especially running athletes or those who participate in repetitive landing from a jump, such as gymnastics. Typically athletes complain of pain that increases over a period of time, usually in response to increased stress. A common story is a runner who is increasing his or her training over a short period of time. Often he or she starts having pain that comes on with a run, and over the next few days or weeks, the pain comes on sooner and takes longer to go away after stopping the run. After a while, pain persists with activities of daily living, such as walking. In the office, the physician will perform a history and physical examination. 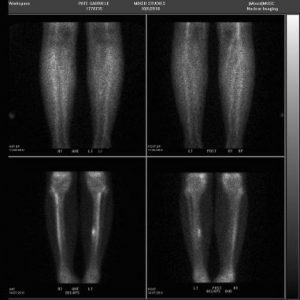 Examination of a tibial stress fracture will often reveal a more localized pain than shin splints, although this finding is not always true. Usually tightness of the calf muscles and numbness and tingling are absent. X-rays will often show a tibial stress fracture if symptoms have been present long enough. Physicians often refer to the x-ray findings as “the dreaded black line,” which is a break in the cortex of the bone but no fracture all the way through the bone or any displacement of the fracture. If the symptoms are fairly recent, x-rays might not show a stress fracture, so further testing, such as bone scans or MRI’s, are often used. Tibial Stress Fractures and Athletes. Treatment of a tibial stress fracture can be either surgical or nonsurgical. This is potentially a worrisome diagnosis, as continued stress on a tibial stress fracture could lead to a complete fracture and require surgical treatment. If nonsurgical treatment is elected, many physicians recommend complete nonweightbearing and use of a cast or walking boot. At a minimum, absolute refrain from the offending activities and sports is mandatory. If the fracture is not healing, we often consider surgical treatment. Tibial stress fractures, especially in the setting of delayed healing, involves placement of a nail down the center of the bone with or without additional bone grafting to try to stimulate healing of the bone. Recovery from a tibial stress fracture is lengthy whether or not surgery is performed. Usually physicians will not let the patient return to sports or exercise such as running until the fracture has completely healed. That process can often take three to four months. At that point, activities are gradually introduced. The time to return to sports is lengthy, but if the fracture heals uneventfully, return to full participation with no limitations is often seen. Note the increased uptake in the mid-tibia on the bone scan of this young athlete.